She expressed concern at the population of poor people living in Nigeria and Africa as a whole. Just a day ahead of her visit to Nigeria, British Prime Minister, Theresa May, lamented about the state of the country's economy which houses the highest number of poor people in the world. The Prime Minister kicked off her first visit to Africa in Cape Town, South Africa, on Tuesday, August 28, 2018, and expressed concerns about Nigeria's situation. Even though she praised the country's economy to be a thriving one, she also complained about the worrying number of poor people living in the country. She said, "Most of the world's poorest people are Africans. And increasing wealth has brought rising inequality, both between and within nations. "For example, much of Nigeria is thriving, with many individuals enjoying the fruits of a resurgent economy. Yet 87 million Nigerians live on less than $1.90 a day - making it home to more very poor people than any other nation in the world." The current estimate of poor people that live in Nigeria was released by the World Poverty Clock in June with 44.2% of its current estimated 196 million population measured to be living on less than $1.25 a day. 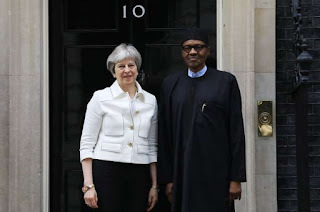 May will meet President Muhammadu Buhari in Abuja on Wednesday, August 29, and also spend some time in Lagos where she is expected to visit victims of modern slavery. She'll conclude her trip to Africa with a visit to Kenya.